At a short distance from the church, on a rising ground, are three pillar-stones set in a triangle about ten feet high above the ground, which appear to have been the remaining supports of a covering-stone long since removed. This chamber, in its original state, must have been one of unusually lofty and imposing dimensions. The farm on which it stands is named Cromlech, which is supposed to confirm the supposition that a Cromlech once stood here. Lower down, however, on the slope of the hill, stood also a Cromlech at the time that the Ordnance [Survey] Map was made, but it has since vanished. From whichever of the two monuments the farm is so called, it would be possible to ascertain by deeds how long the farm has been so-called, as the first use and meaning of the word Cromlech is not yet satisfactorily determined. 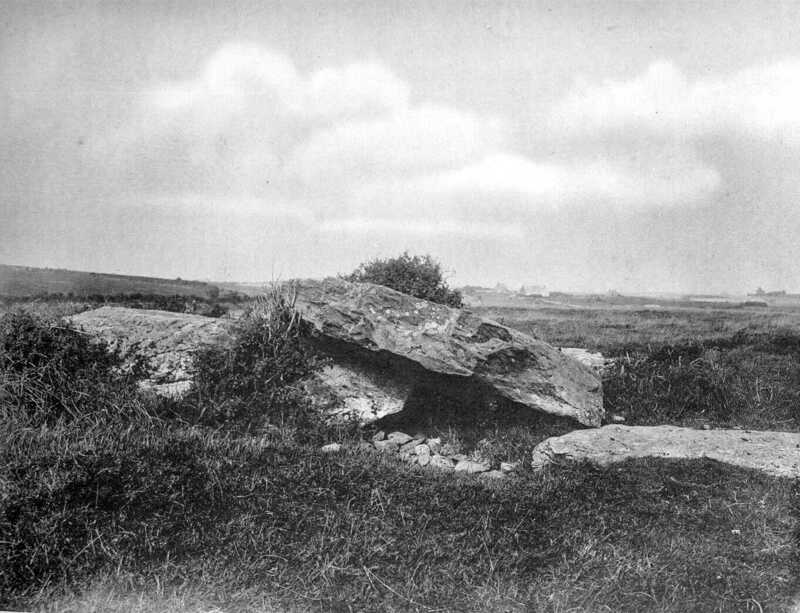 I must correct the writer of the foregoing account by saying that the original Cromlech, as marked on the Ordnance [Survey] Map, is still in situ, and very conspicuous, though its capstone has fallen down and a few of its remaining supports are lying beneath it. It is situated in a field north-west of, and close to, the farm house of Cromlech. It seems to have been a very large Cromlech originally, to judge from the appearance of the capstone and supports that are lying close together. The capstone rests with one end on the fallen suports, the other lying on the ground.. It is ten feet ten inches long by five feet eleven inches wide, and one foot four inches in thickness. I was told by an old man who lived near, that he remembered it much larger than it is at present, and that a piece was broken off and used for building about seventy years ago. The support that lies to the north-east of it is seven feet eight inches long by four feet wide; the others I have not measured.